1. Zen: Undoubtedly the best theme to start with theming in Drupal. The new zen is amazing but I’ve not got change to work with it fully. I’m accustomed to using the Zen Basic but now I’ll move on to this gem of a theme. I has got everything, the template.php, easy customization and lots of code comments to make your life easier. Have a look at this screen cast here, to get your hands dirty. 2. News Portal: Is the next theme I used for my internship project. It is also a clean 3 column fluid width theme that can be great to start working on. It also has the template.php for easy customization and addition of more block regions. It is mainly a blue based theme with easy to edit CSS, I made an orange theme with this theme as the base and used view and panels to get the needed things in place. The files are not commented as zen but they are customizable and you should have some CSS knowledge to get things happening. As the name suggests it will be good for news sites and simple blogs. 3. Alek 2.0: Is a Dark theme with 3 columns and mainly a fixed layout theme. It will be good for sites with heavy content. Based on Amadou, this theme even has icons to suit your needs. 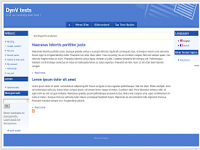 It also has the template.php file and customization will be a piece of cake if have some experience in Drupal theming. 4. Amor Azul: Is a bright blue based theme with lots of content display regions and easily customizable. Highly recommended for content rich sites it is a good theme to begin customizing. A fixed layout with template.php this theme when used with panel can give you the desired look for your site. Code is ok but the detection of browser using PHP is not a good idea I guess, CSS is relatively hard to navigate thru. It is also a 3 column layout with two columns on the right. 5. A3 Atlantis: is a cool theme by Blamcast. It boasts of some good features and yes has a good layout as well. Its simple and clean, I also got the PSD from blamcast and it is a well designed simple theme very good for a blog I guess. Loaded with template.php a thing to notice is it does not have images subfolder none the less it is a good theme. 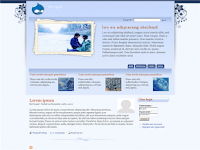 The above five are good themes to get your Drupal site rolling try them. You can get all the themes at http://drupal.org/project/Themes , just wait till the page loads and hit ctrl+f to find the themes there are lots of themes there :-). Try other themes in a live demo here. Happy theming.